I took this photo in 2005 in Prambanan, Indonesia. 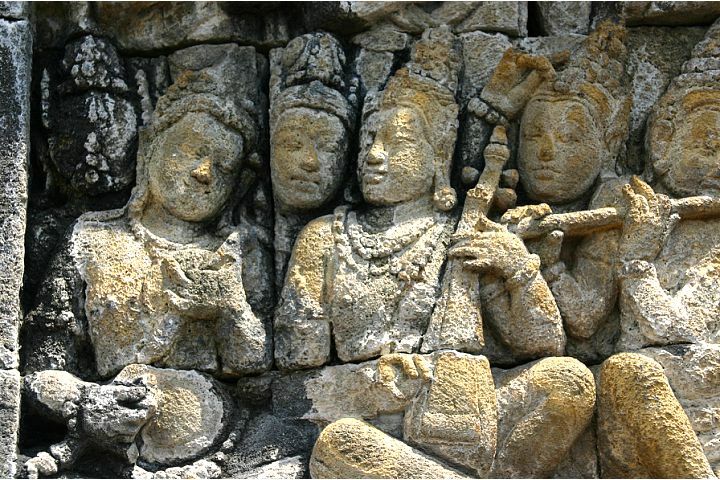 In my previous post, there is a link to Pandit Chhannulal Misra’s recitation of the sutra to indicate how Shiva is the originator of our music and literature. I will speak briefly about this stanza. The silent Siva remains still [as Daksinamurti]. But the same Siva [in another form of his] keeps dancing all the time and it was from his dance that the science of language was born. Nataraja is the name of the dancing Paramesvara. “Nata” is a member of a troupe which also consists of the “vita” and “gayaka”. The nata dances. Nataraja is the king of all dancers– he who cannot be excelled as a dancer– and he is also called Mahanata [the great dancer]. “Nrttavasane. . . ” Nataraja performs an awe- inspiring dance. It seems to bring together all the dance that all of us have to perform, the rhythms of all our lives. Nataraja has a drum in one hand, called the dhakka or damaruka. The tala of this drum (the time kept by it) is in keeping with the “footwork” of the dancing god, the movement of his feet. The beat of his drum is referred to in the words, “nanada dhakkam”. When Nataraja dances, Sanaka and his brother sages, Patanjali Vyaghrapada and so on stand round him. They are great ascetics, so they are able to see the dance. At the close of the dance, the concluding beats(cappu) produced fourteen sounds. 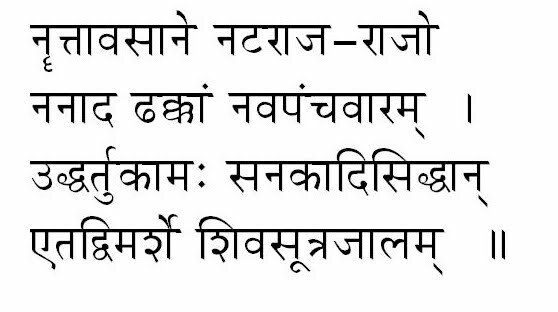 It is these fourteen that are referred to in the stanza (“Nrttavasane”, etc) as “navapancavaram”; “nava” is nine and “panca” is five, so fourteen in all. “Nanada dhakkam navapancavaram. The fourteen sounds produced by Nataraja’s drum are the means by which the reality of Siva is to be known and experienced within us in all its plenitude. Nandikesvara has commented upon the fourteen sounds in his Sivabhaktisutra. 1. a i un; 2. rlk; 3. e on; 4. ai auc; 5. hayavarat; 6. lan; 7. nama nana nam; 8. jha bha n; 9. gha da dha s; 10. ja ba ga da da s; 11. kha pha cha tha tha catatav; 12. kapay; 13. sa sa sar; 14. hal-iti Mahesvarani sutrani. Though the musical instruments do not produce articulate sounds, they create the impression of producing the phonemes of human speech. If this be so in the case of instruments played by humans, why should not the drum beaten by Nataraja during his pancakrtya dance produce articulate sounds?How did Panini make use of the fourteen sounds? He created an index from the sutras to vocalise the letters or syllables together. According to the arrangement made by him, the first letter or syllable of a sutra voiced with the last letter or syllable of another sutra will indicate the letters or syllables in between. For example, the first syllable of “hayavarat”, “ha”, and the last letter of “hal”, “l”, together make “hal”. This embraces all the consonants in between. Similarly, the first letter of the first sutra, “a”, and the last letter of the fourth sutra together form “ac”-this includes all the vowels. The first letter of the first sutra and the last letter of the fourteenth sutra together form “al” – it includes all letters. “Halantasya” is one of the sutras of Astadhyayi. “Al” itself has come to mean writing. “A-kara” is the first letter in all languages. In Urdu it is alif; in Greek it is alpha. Both are to be derived from “al”. So too “alphabet” in English. Here is another fact to support the view that, once upon a time, the Vedic religion was prevalent all over the world. We know thus that the prime source of grammar is constituted by the Mahesvara-sutras emanating from the drum of Nataraja.